The answer is yes. Any system can have vulnerabilities but you can reduce the vulnerabilities by taking measures against them. Let’s take a look at some specific vulnerabilities. All types of electronics recently have had spyware installed on them. This tends to be with cheaper systems. Most, but not all, cheaper systems with spyware come from foreign countries. 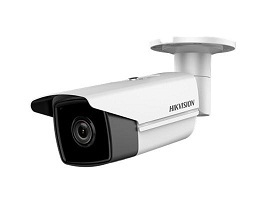 To avoid spyware, only buy security camera systems from trusted manufacturers such as Hikvision. It is possible to hack a security camera network so that you can view all of the cameras from a remote location. This isn’t too common but it does happen. There are several steps to take in order to prevent a hacked network. First, you should always keep your firmware on the DVR and network devices up-to-date. This patches any security vulnerabilities and prevents penetration. Second, you can utilize security technology on your network, such as network addons that add localized security. Remember that the number of features that you add that allow remote connection increases the chance of intrusion into your camera system. Security penetration tests have discovered that smart features can be used to compromise the security of camera systems. To prevent smart features from being used to compromise your security, turn off any feature that you don’t use. After that, make sure you require a password for any remote access. It is also a wise idea to research any remote access features before enabling them. If you have a DVR system that comes with a default password, you need to change that immediately. Systems that utilize a standard default password are some of the first to get compromised. This is because hackers specifically go out looking for these systems knowing that they are able to get into them. Setting a safe and secure password is always advised. The longer the password, the better. Avoid using any birthdays, names, or anything that can be associated with you. Preventing people from guessing your password is vital. A security system won’t do you any good if someone can access the NVR or any of the connected devices. For example, if someone is able to reach one of the cameras they can damage it or obscure it, leaving it incapable of recording what is going on. A NVR can have its memory removed and/or be damaged, preventing the system from functioning properly. To prevent this, the NVR system should be stored in a secure area. Often times a security office is the best place when you are running a business. If you have a home security cameras system, store it in a room with a locking door, or somewhere hidden. Each camera and other device should be mounted out of view with the cabling run through the wall so no part of the system is vulnerable. Vulnerabilities are always being discovered in technology. That is one of the reasons that you want read the news and stay up-to-date on big updates. Taking the steps mentioned here will help to reduce the vulnerabilities in your system. Hiring a professional security camera installation service like Precision Security Australia will further help to keep your system as secure as possible.